Allegations of abuse are being investigated at a home for people with learning disabilities in Bristol. 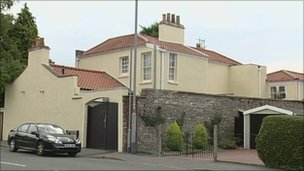 The BBC has learnt that four members of staff have been suspended at Rose Villa, a nine-bed rehabilitation centre in the Brislington area. The home is run by Castlebeck, the company that also ran Winterbourne View where abuse against vulnerable adults was exposed by BBC Panorama. Castlebeck confirmed staff had been suspended and an inquiry was under way. The BBC understands that one person was suspended at Rose Villa in June following allegations made by a whistle-blower. In the past week, two members of staff have been suspended after inspectors from the Care Quality Commission (CQC) raised safeguarding concerns. Misconduct allegations It is believed a further member of staff has been suspended after allegations that a patient was mishandled. It is expected that the CQC's report on the home will be published in the next few weeks. Castlebeck confirmed that four members of staff had been suspended following allegations of misconduct. In a statement it said: "In accordance with our policy we have notified and are working with all relevant authorities as inquiries are being conducted. "As this process is ongoing we are not able to comment further at this time." Avon and Somerset Police said: "Police are assisting multi-agency partners following allegations of abuse. Inquiries continue, however no criminal offences have been disclosed." 'Visit regularly' In a joint statement, NHS Bristol and Bristol City Council said: "The safety and wellbeing of all the patients in the unit is our absolute priority, and we take these concerns with the utmost seriousness. "Although we do not currently have any Bristol residents in the nine-bed unit, as part of our role as the lead safeguarding organisations, we have visited Rose Villa and reviewed the care and wellbeing of the residents as soon as we were made aware of the allegations concerning Winterbourne View. "We have continued to visit the home regularly during the intervening period and have provided additional independent support to the home. "CQC is reviewing all Castlebeck's homes as part of their overall response to the issues raised by the Panorama programme." Winterbourne View was closed following the BBC Panorama programme and Castlebeck apologised. It will only end when care of the elderly comes back under state control and stops being an investment opportunity for wealthy Doctors, Layers, Bankers. When you get properly trained, motivated and supervised staff, and care once more becomes a service and not a profit and loss account, then things will improve. We pulled my Mother out of her first home after 2 months (Social Services helped) as she was being neglected. Please don't think this is racist as the owners were none British, half the staff spoke only poor English and yet they had all the required licences. The Home where MIL finished her days although private was truly excellent. (even though the owner has two Porches). My old Sargent Major (back in the late 80's) used his 50k Gratuity to set up a home when he left the Army. He told us that he was going into the Granny Farming Business. After all, what do old folk need, they don't eat much and give them a couple of games of Bingo a week and their happy. I wish Cameron had to put his parents in one of the non BUPA homes the rest of the Nation has to resort to, things might alter then. Going on I wish someone would name and shame the Shareholders and Landlords of Southern Cross. Life Long Card Carrying Member Of the Union of Different Kinds. Thank you for your post, as for shareholders and profits I have raised that before and yes I totally agree with you. We live in a capitalistic nation where everything has to have a profit and with that everything else like the care of the elderly and even treating consumers fairly takes second fiddle. I have always said that there are instances where profits have to come last and the care home and care of the elderly is one of them they were and in many cases still are our teachers and we treat them with utter contempt. A third care home run by a company at the centre of allegations of abuse against vulnerable patients is to close, it has been announced. The Care Quality Commission (CQC) said Castlebeck had agreed to close Arden Vale, in Meriden, near Coventry, by next Thursday. Castlebeck said it was making other arrangements for the 19 residents. The company owns Winterbourne View, in Bristol, where abuse was filmed by an undercover BBC Panorama journalist. All times are GMT0. This page was generated at 09:54.